The external landmarks of the eye are shown in Figure 10-1, and the cross-sectional anatomy of the eye is shown in Figure 10-2. The eyelids and eyelashes protect the eyes. The eyelids cover the globe and lubricate its surface. The meibomian glands, which are modified sebaceous glands in the eyelids, secrete an oily lubricating substance to retard evaporation. The openings of these glands are at the lid margins. The orbicularis oculi muscle encircles the lids and is responsible for their closure. This muscle is supplied by the facial, or seventh cranial, nerve. The levator palpebrae muscle elevates the lids and is innervated by the oculomotor, or third cranial, nerve. Muller's muscle is a small part of the levator muscle that has sympathetic innervation. Figure 10-1 External landmarks of the eye. the superior oblique, and the inferior oblique muscles. These six extraocular muscles are shown in Figure 10-3. The extraocular muscles work in a parallel, conjugate manner to maintain single, binocular vision. When the head is turned to look left, for example, the left lateral rectus and the right medial rectus contract to turn the eyes to the left. The actions and innervations of the extraocular muscles are listed in Table 10-1, and the extraocular movements are illustrated in Figure 10-4. 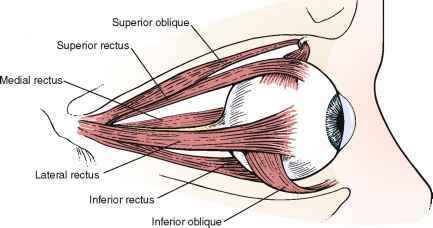 The lateral rectus muscle, which is innervated by the abducens nerve, turns the eye laterally (abducts the eye), as do both oblique muscles. 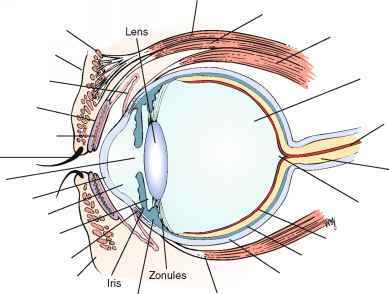 Figure 10-2 Cross-sectional anatomy of the eye. Figure 10-3 The extraocular muscles. the lids, whereas the bulbar portion covers the sclera up to the limbus, which is the corneal-scleral junction. The conjunctiva contains many small blood vessels, which when dilated produce the appearance of a "red" eye. There is little nervous innervation to the conjunctiva. The lacrimal apparatus consists of the lacrimal gland, accessory tear glands, canaliculi, tear sac, and nasolacrimal duct. These are shown in Figure 10-5. The lacrimal gland produces watery tears and is located above and slightly lateral to the globe. Secretion occurs mostly as reflex tearing or crying. Tears drain through the puncta on the lids and into the superior and inferior canaliculi. These canaliculi join and enter the tear sac, located at the medial canthus of the eye. The nasolacrimal duct drains the sac to the nose. 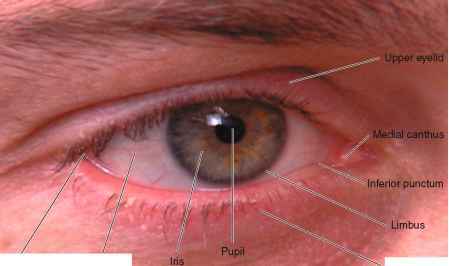 Of the lacrimal apparatus, only the puncta are visible on routine examination. The sclera is the white, fibrous, outer coat of the globe visible just beneath the conjunctiva. The extraocular muscles insert into the sclera. •Remember "LR6SO4." This mnemonic means that the lateral rectus (LR) muscle is innervated by the sixth cranial nerve, and the superior oblique (SO) muscle is innervated by the fourth cranial nerve. All the other muscles are innervated by the third cranial nerve. The cornea is a smooth, transparent, avascular tissue that covers the iris and joins with the sclera and conjunctival reflection at the limbus. The cornea functions as a protective window, allowing light to pass into the eye. The cornea is richly innervated by the trigeminal, or fifth cranial, nerve and is therefore exquisitely sensitive to touch. The anterior chamber, or space between the cornea anteriorly and the iris posteriorly, is filled with clear aqueous humor. Aqueous humor is produced by the ciliary body in the posterior chamber, the area behind the iris and in front of the lens. Aqueous humor circulates from the posterior chamber through the pupil into the anterior chamber and is removed through the canal of Schlemm, from where it eventually enters the venous system. Pressure within the eye is regulated by this filtration. The angle is that formed by the juncture of the cornea and the iris at the limbus. A section through the eye at this level is shown in Figure 10-6. The iris is the circular, colored portion of the eye. The small, round aperture in the middle of the iris is the pupil. The pupil functions much like the aperture of a camera, controlling the amount of light that enters the eye. When a light is shined on one eye, both pupils constrict consensually. This constriction is the pupillary light reflex. To understand this reflex, a brief review of the neuroanatomy is in order. Figure 10-7 illustrates the pathways of the pupillary light reflex. Figure 10-6 Cross section of the normal-angle structures, showing the flow of aqueous humor. Figure 10-5 The lacrimal apparatus. Figure 10-7 The pupillary light reflex. in the primary visual cortex of the occipital lobe. The afferent pupillary fibers bypass the geniculate body and end in the superior colliculus and pretectal area of the midbrain. Light impulses to the eye cause the retina to transmit nerve impulses to the optic nerve, the optic tract, the midbrain, and the visual cortex of the occipital lobes. This is the afferent limb of the light reflex. 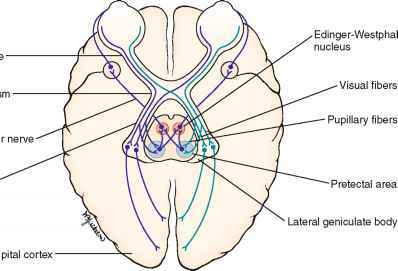 In the midbrain, the pupillary fibers diverge and are relayed by crossed fibers to the opposite Edinger-Westphal nucleus of the oculomotor, or third cranial, nerve. Some fibers remain on the same side. The third cranial nerve is the efferent limb, which goes via the ciliary body to the sphincter muscle of the iris to cause it to contract. The direct effect is the constriction of the pupil of the eye on which the light is shined (the ipsilateral eye). The consensual effect is the simultaneous constriction of the opposite pupil (the contralateral eye). The near reflex occurs when the subject looks at a nearby target. The three parts of the near reflex are accommodation, convergence, and pupillary constriction. Accommodation is defined as the near focusing of the eye, which is effected by increasing the power of the lens by contraction of the ciliary muscle, innervated by the third cranial nerve. There is also autonomic innervation of the eyes. The iris is supplied by sympathetic and parasympathetic fibers. When the sympathetic fibers are stimulated, the pupil dilates, and the eyelid elevates. Think of the cat stalking its prey, pupils dilated, ready to pounce in the dark. The cat needs all the light it can get. The reflex is purely sympathetic. When the parasympa-thetic fibers in the oculomotor nerve are stimulated, pupillary constriction occurs. The lens sits directly behind the iris. It is a biconvex, avascular, colorless structure that changes its shape to focus the image on the retina. The shape is changed by the ciliary body muscles. The vitreous humor is the transparent, avascular gel that is located behind the lens and in front of the retina. It occupies 80% of the volume of the eye. This clear matrix is made up of collagen, hyaluronic acid, and water. It is bounded by the posterior lens capsule anteriorly and the retina posteriorly. The choroid is the middle, vascular layer of the globe between the sclera and the retina. It acts as a source of nourishment, as well as a heat sink, serving to remove the extreme heat produced by the light energy entering the eye. Bruch's membrane separates the choroid from the retina. 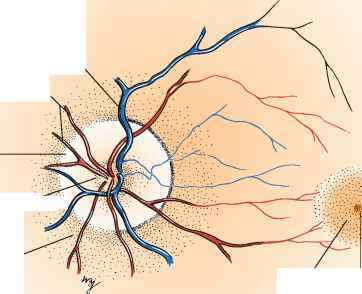 Superficial to Bruch's membrane (closer to the retina) is the retinal pigment epithelium (RPE). The RPE is a monolayer of cells between Bruch's membrane and the retina. Some of the important functions of the RPE are to absorb light passing through the retina and to regenerate the visual pigments.